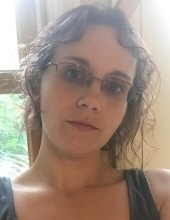 Christina “Chrissy” Louise Jamison (35), died Monday, January 21st, 2019 at her home. Christina leaves behind her husband, Matthew Jamison, Makynzie M. Koch age 16, Joseph G. White age 15 and Makynna M. Nisonger age 12, mother, Anita Snider, sisters Lisa Featherstone and Malinda Brown with husband Derrick Brown, nephews Liam and Laken Bohlen, niece Emma Featherstone-Joseph along with aunts, uncles, cousins and many friends. She is preceded in death by her grandparent, Theresa, and Gerry Phillips and Joseph Snider Sr. Christina was born in California in the city of Redlands on June 14, 1983. She enjoyed being with friends and family. She was an avid gamer and met her husband playing WOW. Christina had a knack for debate and used it whenever she could. Christina had her children early in life and was a stay at home mother. Although Christina had experienced some health problems in the past few years she was happy and continued to be active with her family. She was close with her children as well as her nephews and niece. To send flowers or a remembrance gift to the family of Christina Jamison, please visit our Tribute Store. "Email Address" would like to share the life celebration of Christina Jamison. Click on the "link" to go to share a favorite memory or leave a condolence message for the family.